THANK YOU to our Fargo Table Sponsors: Border States Electric, Catalyst Medical Center, Dakota Medical Foundation/Impact Foundation, Eide Bailly, Roers! Paula Johnson began working for the North Dakota Air National Guard (NDANG) in October 1974, as a full-time federal civilian employee. She enlisted in the NDANG and went to USAF Basic Military Training, Lackland AFB, TX, in April 1984. Her positions at the NDANG included, 119th Wing Commander’s Executive Assistant, Multimedia Support Center Manager, and Information Systems Branch Chief. 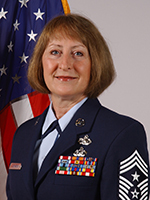 From 2008 to 2012 she served as the North Dakota State Command Chief Master Sergeant. Chief Johnson reported directly to The Adjutant General (TAG), North Dakota and was a member of the TAG’s Joint Executive Council. She managed the NDANG’s Outstanding Airman of the Year program, the Air National Guard (ANG) Hometown Heroes program, and was the TAG’s advocate for NDANG enlisted issues. Chief Johnson served more than 27 years in uniform and 34 years as a federal technician. Currently, she serves on the New Life Center Auxiliary Board. A member of Dilworth Lutheran Church, she is the Church Council secretary and Annual Pork Dinner & Raffle chairwoman. Chief Johnson is a lifetime member of the Enlisted Association of the National Guard of the United States and the ANG Command Chief Master Sergeant Association. An NDSU alumnus, she earned a bachelor’s degree in Management Communications. Paula and her husband, Burton, live in Oakport; have three married sons and three grandsons. She enjoys traveling, photography, Pilates, BSF, baking, and gardening. Deb Anderson is the President of Summers Mfg. Co., an agricultural equipment manufacturer, and has been with the company for 39 years. She attended the National College of Business in Rapid City, South Dakota prior to joining the family business in 1975. She began her career at Summers Mfg. Co. in the finance department as the controller and became the VP of Finance in 2003. In 2008 she was elected President of the company, a year after the company became 100% employee owned. Deb has been instrumental in leading Summers’ in their journey from family owned to employee owned by implementing her own vision of creating trust throughout the company through Visibility, Accountability and Education. She loves to share the story of how Summers Mfg. is developing a culture of Ownership Thinking through open book management and company values. In 2013 Deb was one of the first recipients of the Women in Manufacturing STEP (science, technology, engineering and production) award, given by the Manufacturing Institute in recognition of significant achievements made by women in the industry. Deb also serves on the Board of Directors of the North Dakota Chamber of Commerce and the Foundation Board of Lake Region State College. Ellen Linderman grew up on a dairy farm in west central Minnesota. She attended Moorhead State College, Moorhead, MN and Marycrest College, Davenport, Iowa. When her 3 children were finished with college, Ellen enrolled at North Dakota State University as an older than average student and completed a BS in Sociology with a minor in Women’s Studies. She and her husband have been farming since 1976 near Carrington, ND. They grow hard red spring wheat, irrigated corn, and food grade soybeans that are sold into the Japanese market through SB&B Foods, Casselton, ND. 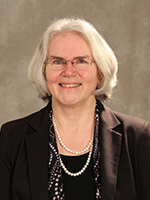 Over the years Ellen has been an active participant in her community by serving on various boards and committees, including the City Library Board, Sacred Heart Parish Council, and the Carrington Health Center Auxiliary. 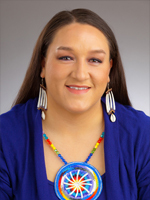 She has also been a member and leader of both the Foster County and the North Dakota Family & Community Education Association. While her children were growing up she also served as a 4-H leader, CCD teacher and Farmers Union Youth Director for a number of years. Over the years, Ellen and her family have been active politically, both through party politics and through North Dakota Farmers Union. She has had numerous opportunities to advocate for agricultural and rural issues both on the state and national level. She also took advantage of the opportunity to run for the state legislature a few years ago. In addition to actively working the fields on the farm, Ellen also served two terms as Chair of the North Dakota Farm Service Agency State Committee, and was appointed a commissioner on the Payment Limit Commission by the chair of the US Senate Agriculture Committee. At the present time, she is in her second term as a member of the board of directors for the Federal Crop Insurance Corporation. Ellen has been very active in North Dakota Farmers Union since 1976. She is currently serving her 4th term on the State Board of Directors and is State Secretary. She also serves on the Board of Directors of the Farmers Union Mutual Insurance Company and Farmers Union Service Association. 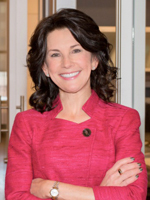 Tammy Miller joined Border States in 1991. She held various positions in the company and was named CEO in 2006. From the time Tammy took over as CEO in 2006, the company has executed an aggressive growth strategy. Border States is 100% employee-owned through an Employee Stock Ownership Plan (ESOP) The company provides products and supply chain solutions to the construction, industrial, and utility markets, has 80 branch locations in 16 states, and is headquartered in Fargo, North Dakota. It is the eighth largest electrical distributor in the United States with sales exceeding $1.5 billion. Tammy currently serves on several boards within the industry and for philanthropic organizations. 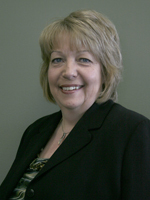 She has received numerous awards for her exceptional career in distribution and community service involvement. Tammy strives to motivate employees to accomplish more than they ever dreamed possible. Plus, she likes to win and is very disciplined. Be it a strategic goal at Border States, a half-marathon, or a fundraising goal for a nonprofit, when she sets a goal, she is very focused and surrounds herself with great people to achieve it. Tammy’s strengths are in setting strategy, executing that strategy, and being accessible. In her spare time, Tammy loves to run, read, travel, and volunteer. Tammy and her husband, Craig Palmer, make their home in Fargo, North Dakota.